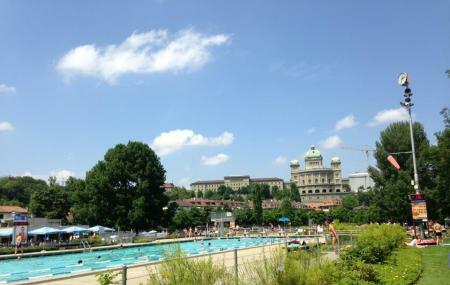 Freibad Marzili, also called as Marzilibad is the most popular pool in Bern. With a lap pool, a section especially for women, a children’s pool and a diving pool, it is very famous amongst the youngsters as well as families. The pool is crowded during the warm weather, when the local people and tourists come to get some relief from the scorching heat. Easily accessible from every part of the city, its locality plays in favor of its popularity. The pool is surrounded by a pleasant park with restaurants, cafes and eateries in its vicinity. The playground itself has a children’s play area with slides, swings and other activity structures. While in Bern, a visit to this pool is a must as what it offers is so much more than what can be described. Enjoy! Children are not allowed in the women's pool. While entrance fee is nil, cabins, valuable compartments and dressing gowns can be rented for a charge. Pool is open from April to September only. How popular is Freibad Marzili? People normally club together Prison Tower and Museum Of Natural History while planning their visit to Freibad Marzili. Amazing place for swimming. There are different pools with different deep. Everyone could find something for him/herself. Also there is good opportunity to swim in the river and other sport activities. Perfect for summer, you can swim in the river (Aare) or in the pool. The entry is for free and from down there you can see the Bundeshaus. Very nice place to enjoy ...good fast food restaurant, good swimming pool, and the river is right there. Amazing Place to relax, you can jump into the are river in the summer really great fun. The people are all polite, Great space to take kids as well.